With PTC Windchill 10.2, both the content and the functionality of the PTC Windchill Help Center have been enhanced to support user adoption and improve the user experience. As customers requested, Changes for This Release content is richer and more comprehensive. Those topics are listed at the top of the PTC Windchill Help Center table of contents, along with the compiled Enhancement Details document. New navigation aids have been introduced, making it easier to understand content organization. Customers can download the Add Topics utility to add site-specific topics to the PTC Windchill Help Center table of contents. For more information about the download location and customization procedure, see the PTC Windchill Customization Guide. Conceptual overviews of core PTC Windchill capabilities, including configuration management, change management, and contexts, have been added. Based on customer feedback identifying high-priority topics, each of the Workgroup Manager guides now begins with “getting started” information. 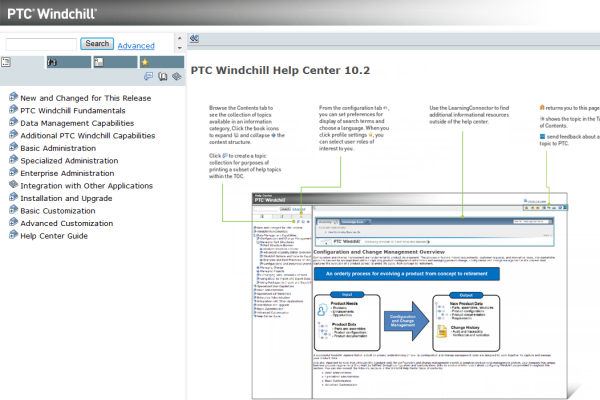 PTC Windchill installation content has been streamlined and reorganized for improved flow and readability. New content has been created to assist with installation of the Quality Management System. For more detailed information about these and other PTC Windchill Help Center enhancements, see the Changes for This Release topic in the PTC Windchill Help Center.